What Type Of Cardio Should I Be Doing? Everybody always wants to know what type of cardio they should be doing and how much of it. It’s never easy to discern what’s true and what isn’t when every person and fitness magazine is telling you something different. I want to let you know that there is no magical formula for cardio, and it isn’t rocket science. But I want to help clear up some of the confusion. The first thing we need to go over is the difference between steady-state (aerobic) cardio and interval (anaerobic) cardio training. What you see most people doing is what we call steady-state cardio. You know, where the people are on a treadmill or elliptical for what seems like hours. They barely break a sweat and don’t really breathe very hard. It essentially means you have reached a point during your cardio where you almost feel comfortable. You’re breathing harder than normal but it’s not too intense. A simple way to judge where you’re at is to go by the “broken conversation” rule. If you can talk to somebody else in broken sentences, but not having to breathe between every word, then you’re at the right level of intensity. Now the other type of cardio we have is interval cardio training, aka anaerobic cardio. This is what you typically see track-and-field athletes doing. Short bursts of very high intensity sprint work. Essentially a work/sprint period followed by a rest/recovery period. 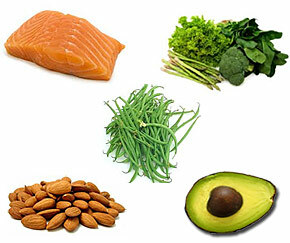 The idea is to work extremely hard for a brief period of time and then take a recovery period. The work to rest ratio generally starts around one to three. So if you did one minute of sprinting you would follow that with three minutes of rest and recovery. Then you would repeat that for a number of sets. Once you get in better shape you may go to a 2:1 or a 1:1 work to rest ratio. If you’re really fit you may even have a shorter rest period than work period. The idea is to get your heart rate up as much as possible, then recover and try to bring it back down. This allows you to work extremely hard as you have a longer time to recover between intervals. Now there are pros and cons to both types of cardio and I will list them out below for you. Steady-state cardio, also known as aerobic conditioning, is typically performed on a treadmill or elliptical. A good length to shoot for is 40-60 minutes. It’s all about burning a lot of calories, so the longer you perform steady-state cardio the more calories you’re going to burn overall. Typically 40-60 minutes in length. Performed at one pace on a treadmill, elliptical, or bike. Go by the “broken conversation” rule. Easier to perform than interval work. It takes a lot of time, typically almost an hour per session. It wastes muscle (which is the last thing we want to do). Your body adapts very quickly to this type of cardio. Interval cardio is best performed on a bike or elliptical. It can also be done on a treadmill or a rower. It can be performed anywhere between 20-30 minutes max. This gives you enough time to torch some serious calories, but not overdoing it as the intensity is very high. Typically 20-30 minutes in length. Performed at all-out work periods followed by slow and easy rest/recovery periods. The idea is the get a burning sensation in your legs and lungs. If you don’t feel this you’re probably not working hard enough during the intervals or you need to make it harder by increasing the length of the work period, resistance, or incline. Lots of calories burned relative to the amount of time you perform it. Takes only twenty to thirty minutes at the high end to receive the benefits. It offers more “bang for your buck” than steady-state. No muscle wasting like steady-state. Your body has a hard time adjusting to it because you can continue to make the intervals harder through various methods such as increased resistance, speed, incline, time performed. It improves both your anaerobic and aerobic conditioning. It’s very difficult if you’re new to it. Well it depends on your goals. 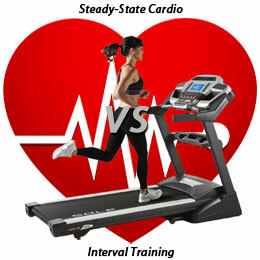 If you really need to lose some weight and are new to cardio, then steady-state cardio may be a good start for you. I would start with three days of easy steady-state work such as walking on a treadmill then eventually build yourself up. Once you get past this you can increase the incline, increase the amount of time, or even increase your speed a little bit to make it more difficult. You could work yourself up to six days per week of steady-state cardio. If you’ve already been performing cardio for a while now (i.e. more than a few weeks) then you should be able to get into interval work. Interval work won’t drop the numbers as fast off the scale, because it doesn’t burn quite as many calories up front, but it’s going to preserve the most amount of muscle which is what you want in the end. Week 1 – 8x of 20 seconds of a sprint/fast jog followed by 1 minute of walking/rest. Week 2 – 10x of 20 seconds of a sprint/fast jog followed by 1 minute of walking/rest. Week 3 – 12x of 20 seconds of a sprint/fast jog followed by 1 minute of walking/rest. Week 4 – 8x of 30 seconds of a sprint/fast jog followed by 1 minute of walking/rest. Now a sprint can be done on an elliptical or bike, it doesn’t have to be on a treadmill. Any time that you increase your speed or intensity for a brief amount of time is considered a sprint. Again, once you feel more comfortable you can increase the speed that you run at or the incline to make it harder. Or if you’re on an elliptical or bike you can increase the resistance during the sprint part of the interval. I like to start with a five minute warm-up. Once I’m ready to go I like to crank the resistance up to 10 and go on an all out sprint. I’ll do this for twenty seconds then start my recovery period. I’ll do this by bringing the resistance all the way back down and going as slow as I want. And so on for a total of about 20 intervals total. That’s my overall favorite cardio workout. It’s a short enough sprint to get through no matter what kind of shape you’re in. But it can also adjusted to be difficult for even the most fit individuals. There are so many ways you can do intervals. Start with a 1:3 work-to-rest ratio and then work your way up to a 1:1. Once you get to that point you should be well on your way to seeing some serious results. One thing you have to be careful of when you’re first starting out is not going overboard with cardiovascular training. If you’re not used to it, you really need to make sure you’re taking a true progression to build up your endurance and stamina. I see it happen too many times where people who haven’t run in years decide to start running every single day. You know what happens to them? All things that can be avoided with the proper progression of cardio. If you’re doing absolutely no cardio right now you can start with just a couple of days a week. Work your way from walking, to jogging, to interval sprints. You also want to work your way up from the amount of times you’re doing cardio. Start off with one day of walking, then two, three, and so on. Once you’re walking most of the days of the week for 30+ minutes then you can start jogging. Cut down the time again because jogging is harder than walking. Build yourself back up. This is how we make sure you progress and prevent injuries. These are obviously just samples of what you can do, but it’s a start. There are tons of ways to adjust your cardio workouts to make sure you keep progressing. Hopefully you now understand a little more about the types of cardio and what you should be doing. Interval cardio training is more bang-for-your-buck than steady-state cardio. Steady-state is best if you’re brand new to cardio. Interval cardio training is best in the long run if you want to help shape yourself into a lean body. It doesn’t matter where you start, just get going. Even if it’s only a couple of days a week for ten minutes a session, it’s still better than nothing. Make sure you progressively increase your workout difficulty. Don’t go all out right off the bat. Author's Website Alan Koger started weight training at a young age in order to compete against his two older brothers in sports. He played varsity soccer, and later on professionally in the MLS, as he earned a bachelor’s degree in Kinesiology and Health Sciences from the College of William and Mary. Alan currently owns his own personal training studio with two other partners in Richmond, VA. Their studio focuses on the combination of proper resistance training, cardiovascular training, and nutrition in order for their clients to achieve the results they desire.